A new study shows that a whopping 60% of Texas students are suspended at some point in middle or high school — and those getting the harshest suspensions are students of color. According to the Times, the Council of State Governments found that 31% of Texas middle- and high-schoolers received an expulsion or out-of-school suspension at some point. If you add in-school suspensions, the figure jumps to 60%. And perhaps most disturbing of all, recidivism rates were very high: kids who got out-of-school suspensions or expulsions got an average of four of them, and one in seven kids had eleven or more disciplinary actions on their records. So clearly suspensions and expulsions aren't stopping the behavior they're meant to punish. Nor are they meted out fairly. The study found that students of color were more likely than white kids to get out-of-school suspensions rather than the less severe, in-school variety, and more likely to be transferred to alternative classrooms. This jibes with recent evidence that gay students are more likely to be punished at school than straight ones — already-marginalized groups appear to face harsher sanctions from school systems. How to fix this? Says school psychologist Russ Skiba, "What we really need to do is go in to those districts and see if these really are choices being made." 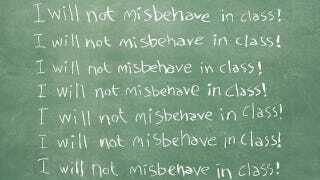 That is, school officials need to examine ways in which disciplinary policies or their implementation may be biased against certain students. They also clearly need new methods of discipline, ones that provide more than a way to punish the same students again and again and again.